For athletes, recovering from a workout is as important as the hard effort itself. One of the best ways to boost post workout recovery, however, has often been overlooked. While people understand the role that hydration plays during exercise, the power of post workout hydration is the missing link in optimal performance. Water plays a significant role in the process of recovery - from helping digest nutrients, to repairing muscles damaged during exercise. Our muscles are actually 75% water. 1- Quicker Muscular Repair - Exercise causes muscles to become stronger by first breaking them down and then rebuilding them using muscle protein synthesis. This protein synthesis requires that muscles are well hydrated. If you are dehydrated following a workout, the protein synthesis that rebuilds muscles is slowed and will delay your muscle recovery. 2 - Better Digestion - After that big workout, eating enough to refuel and replenish glycogen levels is important to your post workout recovery. The digestion of food also requires the presence of copious amounts of H2O. Saliva, which helps break down food, is composed primarily of water and is crucial to digest and absorb all of the nutrients you are eating. And your saliva needs some help. Therefore, re-hydrating after a long or short workout aids in the efficiency of the digestive process. 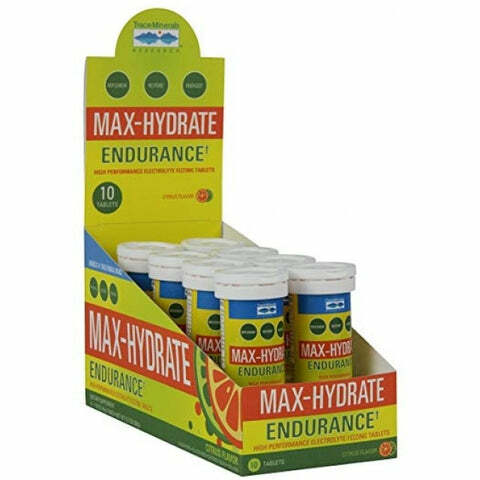 Max Hydrate High Performance Electrolyte effervescent tablets. You get 8 tubes of the best high performance electrolyte effervescent tablets. Each tube has 10 tablets. 3 - Reduced Fatigue - One of the most common signs of dehydration is fatigue. When you are dehydrated, your blood volume is decreased which means that the heart has to work harder to pump the blood to all of the parts of your body that need its vital oxygen and nutrients. Fatigue hinders post workout recovery and feeling fatigued and lethargic reduces motivation for your next workout. 4 - Heart Rate Recovery - A 2012 study of the role of hydration in athletic performance found hydration had a huge impact on recovery. In the study, individuals did a 90 minute run on a treadmill under one of two conditions - either they drank a sports drink during and after the workout or they did not hydrate at all. The study found that people who hydrated showed significantly faster heart rate recovery following the workout which indicates that their bodies quickly recovered from the stress of the workout. Hydration after exercise clearly has a large impact on recovery. Especially in hotter temperatures - but no hydration slacking is suggested for working out in colder temperatures. It is crucial to develop a post workout hydration protocol that replenishes the liquids, electrolytes and sodium lost during exercise. Focusing on post workout hydration gives you an extra boost to recover from a workout and get the most out of the next one. Plus, who likes to be thirsty - no body.